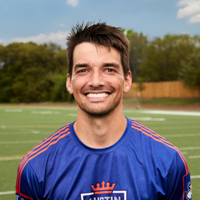 Matthew, or Crank, began his ultimate career at UT Austin playing for five years from 2004-2009. After school he started coaching at UT and has been involved in that for most of the last 10 years. Crank works as a physical therapist in order to help others become the best version of themselves they can become. Small body. Big smile.